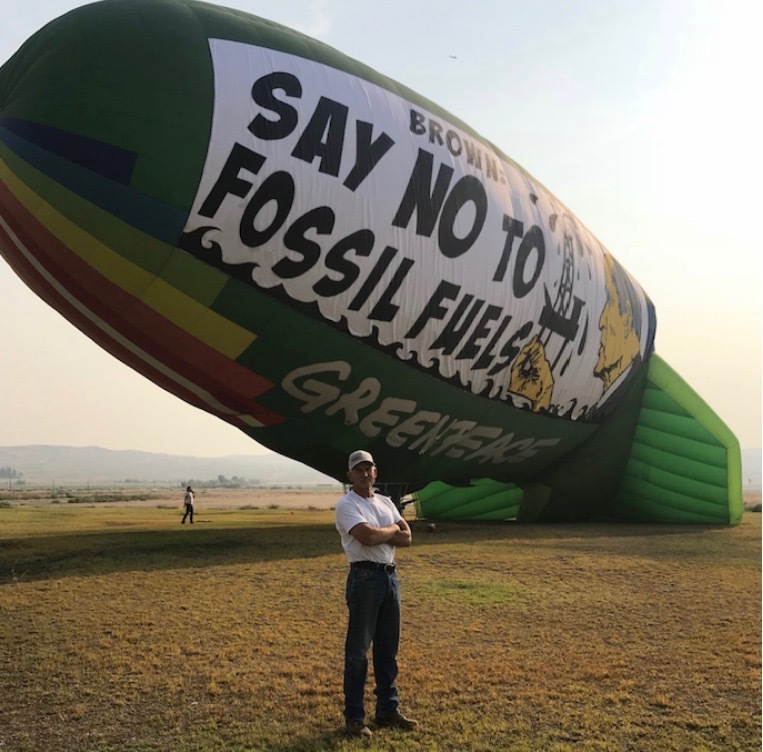 The writing on the green (colored) blimp called for environmental leader and Governor of California Jerry Brown to take a stand against oil production in California, the sixth-largest oil-producing state. This is a strange plea, given that at present California is only producing 38 percent of the oil that state residents consume and importing the rest while our demand for gasoline and diesel is only increasing. Gov. Brown, the politician who has been leading California in its pursuit of sustainability, and was even hailed as “America’s unofficial climate change ambassador” by the Los Angeles Times, has a firmer grasp on reality than Greenpeace, as he has recognized that California can be in the vanguard of environmental policy and still have a thriving energy industry governed by the strictest regulations in the nation. One of the Greenpeace activists, identified as Mary, responded by claiming that Greenpeace only wanted to “protect the communities that are being polluted by [the oil companies].” Turning this into a teaching moment, Mayor Noerr explained the important role oil production plays in California and Kern County’s economy currently and historically. He also reminded Mary that the oil production companies she disparaged actually donate “hundreds of billions of dollars to this state [California],” and that “no school, government, or government program” runs without the economic activity and tax revenue made available by oil and gas production. He could also have educated Mary about the environmental benefits of developing oil under the nation’s strictest regulations instead of importing it from countries with laxer environmental rules. All Californians want safe and clean communities, clean air and clean water. And the energy industry works closely with policymakers and regulators toward that goal. Let’s not forget that the nation’s most populous state met its 2020 greenhouse gas reduction goals two years early while remaining a major oil and gas producer. Californians know that eliminating oil production in the world’s fifth largest economy is neither practical nor environmentally sound. Glad ya’ll came to visit Energy In Depth-California today!